We are a blueberry-loving family. I could easily eat them by the pint (or more). Our girls aren’t far behind—we always know they’ve been diving into a bowl of blueberries by their tell-tale stained fingers and lips. For Father’s Day earlier this year, I requested blueberry pie as the dessert. Growing up, my favorite yogurt flavor was blueberry fruit on the bottom (to this day, I mix some wild blueberry jam into a serving of plain Greek yogurt). 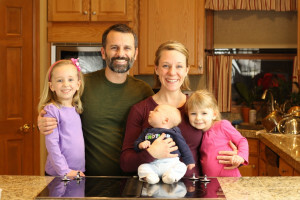 Kelli has fond memories of going blueberry picking, and at any point in time, she’s got a load of frozen blueberries in the freezer ready for baking at a moment’s notice. What’s not to love about the delightful little fruit? 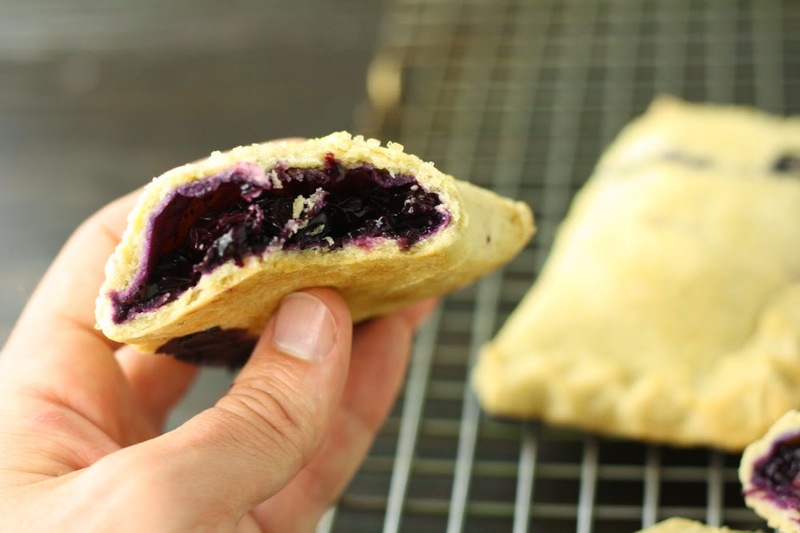 Now, with this recipe for easily portable blueberry hand pies, we can take that love to go … whether for breakfast in the morning or dessert in the evening. And you can, too. 1. Combine 1 1/2 cups of the blueberries, plus the sugar, cornstarch, and salt in a saucepan. 2. Cook over medium heat while stirring, until the mixture begins to simmer. Cook for an additional 3 minutes until the mixture is thick and bubbly. 3. Remove from the heat and stir in the remaining blueberries and lemon juice. Place in the refrigerator to cool. 4. Preheat the oven to 375 deg F. Line a baking sheet with parchment paper. 5. Meanwhile, make the pastry. Mix together the flour, xanthan gum, and salt. Use your hands, a pastry blender, or two knives to cut the butter into the flour until the mixture resembles fine crumbs. 6. Mix together the water, egg, and apple cider in a small bowl. Add to the flour mixture and stir to make a dough. 7. Place the dough on top of a piece of plastic wrap that is about 20 inches long. Place a second piece of plastic wrap on top of the dough. Roll out to a rectangle about 12 x 18 inches. Remove the top piece of plastic wrap. 8. Cut the rectangle of dough into 6 squares—make evenly spaced cuts, one lengthwise and two crosswise. 9. Place two heaping tablespoons of filling on the first rectangle near one edge, leaving an exposed margin of dough. Fold over the naked half and crimp the edges to form a tight seal. 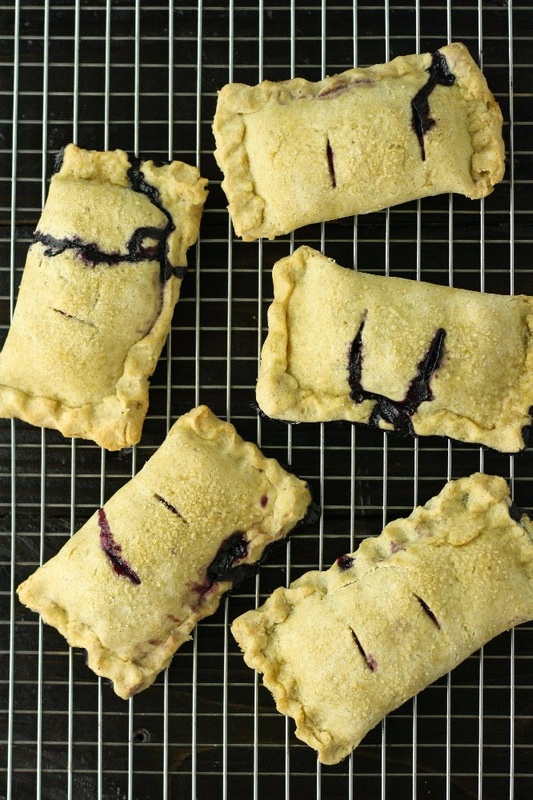 Place the completed hand pie on the prepared baking sheet. Repeat with the remaining rectangles. 9. Brush the tops of the pies with milk and sprinkle with the turbinado sugar. Cut two small slits in the top of each pie. 10. Bake for 30–35 minutes, until the crust is golden and the filling is bubbling out of the holes. 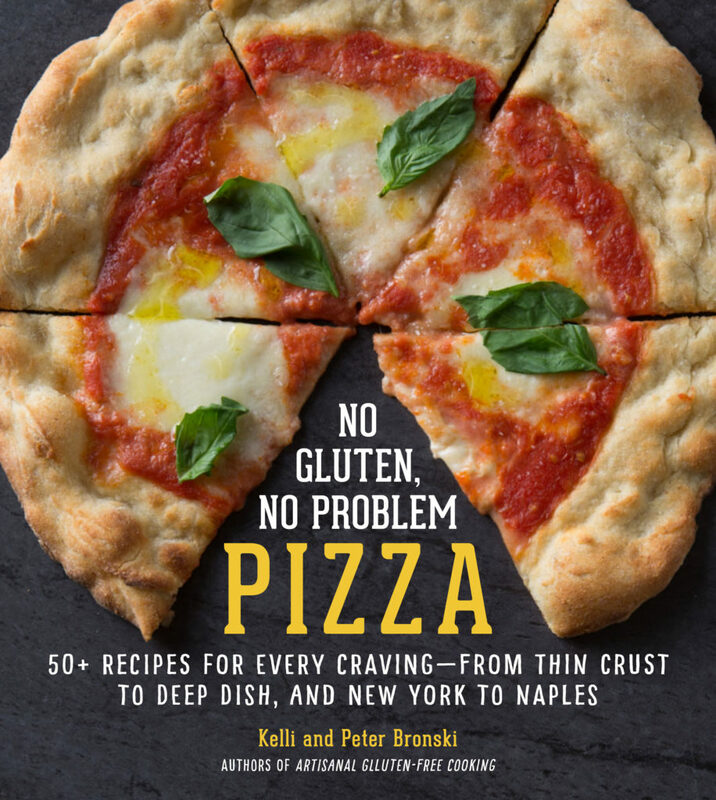 « Cookbook Giveaway Winners Announced! These look great Peter. Definitely something I will put on my list to try. I’m sure my kids will love them. I will probably try them with a strawberry filling as well. I bet strawberry filling would be delicious as well!